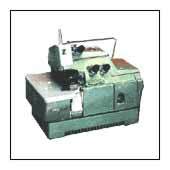 We supply superlative overlock sewing machine which are used in various applications like hosiery, tailoring houses, blanket whipping, for knitted hosiery stitching etc. Our overlock sewing machine is highly reliable and stitches at an incredible speed of 6000 stitches per minute. Our overlock sewing machine is accessible at pocket friendly prices.